THE BAIKAL, the world’s deepest lake, stretches 391 mi (636 km) long and nearly 50 mi (80 km) wide. On the northeastern borders of central Asia, it lies at an altitude of 1,494 ft (455.6 m) above the PACIFIC OCEAN sea level. With an area of 12,162 square mi (31,500 square km), the Baikal ranks seventh in the world after the CASPIAN and ARAL seas, the North American HURON, MICHIGAN, and SUPERIOR lakes and VICTORIA in Africa. The lake is surrounded by the vast mountains of the Eastern Sayan massif with an absolute altitude of 11,453 ft (3,491 m). Many of the Sayan mountain rivers flow into the Baikal, like the Irkut and other tributaries of the Angara. The Baikal region is characterized by a continental climate. In winter, the mean temperature falls to 1 to -13 degrees F (-17 to -25 degrees C), the absolute minimum is -35 to -40 degrees F (-37 to -40 degrees C). The mean summer temperature of July, normally the warmest month in the Baikal region, is 66 to 68 degrees F (19 to 20 degrees C), with a maximum of 100 degrees F (38 degrees C). The underwater slopes of the Baikal depression show a distinct ancient relief of the coastline. Down to depths of 1,640 to 1,968 ft (500 to 600 m ), it uncovers submerged mouths of rivers and ancient valleys. About 3.5 million years ago, the Baikal was born by a rift when the Eurasian and Indian plates collided. Tectonically, the lake consists of three deep basins, each separated by underwater uplifts. Winds and changes in the atmospheric pressure have an influence on the water level. The mean perennial level stands normally at 1,494 ft (455 m). The highest level, measured on October 2, 1869, was 1,499 ft (457 m); the lowest, 1,492 ft (455 m), was observed in April 1904. The first research on the Baikal was done in the 18th century by the German explorers I.E. Gmelin, P.S. Pallas, and I.G. Georgi. Systematical studies on the Baikal were encouraged in the 19th century by the Russian Geographical Society. W. Dybowsky distinguished in 1912 two complexes of the Baikalian fauna: the general Siberian fauna and the endemic fauna. In response to the ecological conditions, these two species are developing completely differently. Ordinary Siberian fauna do only colonize the areas of mild temperatures, that is, near the shores. In contrast, indigenous Baikalian fauna can be found in the depth of the lake. Therefore, the temperature of the water presents an ecological barrier. The greatest enigma for scientists is the presence of seals in Baikal. Alexander VON HUMBOLDT suggested in 1843 that the presence of seals in the Caspian Sea and the Baikal was evidence of a past connection between these two lakes. The German explorer O. Peschel believed in 1878 that Baikal was directly connected with the Arctic Ocean and that seals migrated from the north. Others, like V.P. Garyayev (1901) and German paleontologist M. Neimeier (1886), thought that the fauna of Baikal was a relict of an old marine fauna. The Baikal environment is very sensitive to ecological changes. When in 1957 the Soviet government planned to build a cellulose plant at Baikal’sk, local scientists, citizens, and writers like Valentin Rasputin launched a protest campaign that succeed after thirty years. 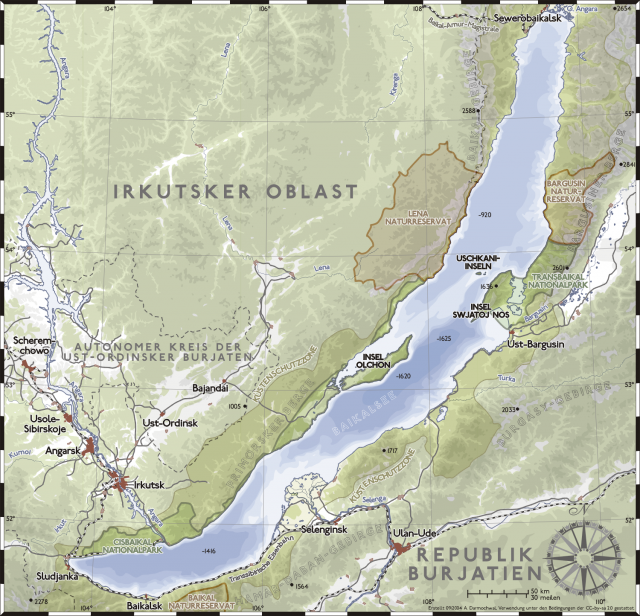 In April 1987, the Soviet government issued a decree protecting Lake Baikal. Nevertheless, the cellulose plant is still producing industrial waste and dumping it into the lake.